Drink in a Box now brings you Snack in a box - a better and eco-friendly way to pack snacks and protect them from getting crushed in your bag. 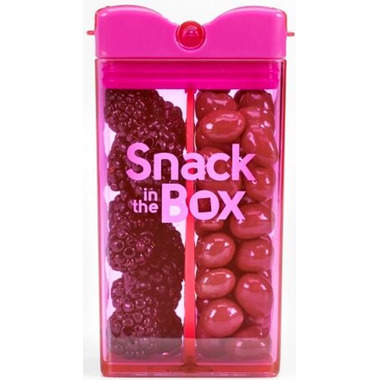 This container features a unique, patent-pending design with twin 6oz chambers, which let you pack 2 different snacks. Pop-up doors make it easy to pour a small handful as you go. 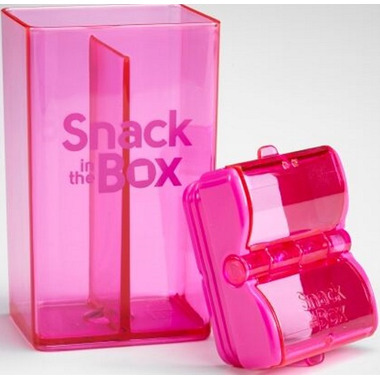 Snack in the Box is made with eco-friendly Tritan plastic and food-grade polypropylene, and is BPA/BPS and phthalate free. Go for a litter free lunch and stop buying expensive prepackaged snacks which can hide sugars and preservatives by packing healthy snacks instead! I bought this to help with snacks when we go on family outings. Originally I wanted to put it into the kids lunches but since I switched to a single divided container this will not fit. The kids love them, they're able to have some variety and control which snack they want to eat first. The opening isn't huge but the kids either dump stuff into their hands or tilt it and pull them out at the openings. I did have one of the containers pop open in the backpack however which is why I've reduced the star rating.